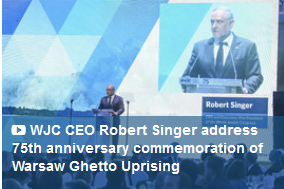 The World Jewish Congress organized a delegation to Warsaw to Commemorate the 75th Anniversary of the Warsaw Ghetto Uprising. 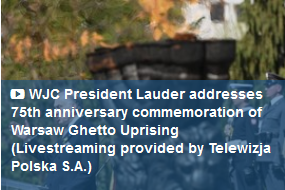 The program included a number of elements such as the official ceremony which was addressed by Polish President Duda and WJC President Amb. Ronald S. Lauder; the screening of the documentary 'Who Will Write Our History' at the Polin Museum in the presence of producer Nancy Spielberg and Prof. Kassow; and an opportunity for participants to tour the museum with its Director Dariusz Stola. As the anniversary coincided with Yom Ha'azmaut - Israel's Independence Day - delegates also took part in a number of related celebrations including at the Nozyk Synagogue where they were addressed by Chief Rabbi Michael Schudrich, Union of Jewish Communities in Poland President Leslaw Piszweski and Warsaw Jewish Community President Anna Warsaw Community President Anna Chipczyńska. On the final night, to mark Israel's 70th birthday, delegates were treated to an evening of Israeli themed entertainment with a performance by Israeli singer Vladi Blayberg.